Two-Up is one of the most quintessential games to the Australian national identity. It is played religiously across pubs, clubs and RSL’s in Australia and New Zealand on ANZAC Day – April 25th. Because of this, Two-Up is made legal in Australia once a year: ANZAC Day. But what is Two-Up? How is it played? What is the history behind it? And most importantly, will it ever be available to play at your favourite online casino? Two-Up has its roots firmly planted among English and Irish peasants who came across as the first convicts. 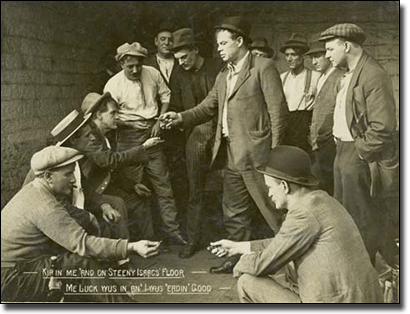 It is believed Two-Up evolved from a popular game called Pitch and Toss in the 18th century, which involved a single coin being tossed and wagered upon. The convicts began the playing Two-Up to help pass the hard time in Australia’s first prisons, with it first being documented by New South Wales’ first Judge Advocate in 1798. Two-Up’s popularity exploded across the map of Australia with the advent of the Gold Rush in the 1850’s. With so many gold miners suddenly finding themselves with a little extra disposable income, it is no wonder Two-Up became so widely played. Australian soldiers could often be found in a circle playing Two-Up in the trenches during World War 1 and World War 2. This was a testament to Aussie’s being a little cheeky and the larakin demeanour, because gambling was technically outlawed among Aussie soldiers. Usually supervisors would just turn a blind eye to some harmless Two-Up playing. We play Two-Up in honour of our fallen soldier’s favourite past time in the trenches. A game they played to distract themselves from the fact they were knee deep in mud, half a world away from home, fighting for the freedom we enjoy today. Since then Two-Up has been legalised once a year in honour of our fallen heroes. How do you play Two-Up? Two-Up is traditionally played with two pre-1939 Australian pennies and a small plank of wood, known as a kip. The game can get underway once a “spinner” has been chosen by the “ringie”. The spinner is the person who holds the kip and flips the two coins. Before play can get underway though, the spinner must make a bet against one of the gathered punters. All of the other punters will gather in a circle around the spinner and ringie and can wager among themselves on the outcome, whether the spinner will win or not. One Head one Tail, or an “odd” – spinner throws again. Is Two-Up coming to online casinos? Online casinos and game developers produce games that need to have a truly international draw. Two-Up is widely unknown outside of Australia and New Zealand so it is unlikely that such a niche game would ever be produced for mass consumption at an online casino. Single Head – 1:1 – 3.125% house edge – a pair of Heads. Single Tail – 1:1 – 3.125% house edge – a pair of Tails. Spinner’s Bet – 15:2 – 3.4% house edge – available to the spinner only. Must spin three of their designated bet: heads or tails. Five odds – 28:1 – 9.375% house edge – spinner throws five “odds” in a row. Banker wins, pays even money. Player wins, pays even money. Every online casino that offers table games has a wide range of Baccarat games available. Because of the minimal skill and tactic required for Two-Up you could opt to play a game like Casino War online. War is a simple game, all you have to do is beat the dealer’s card. If you have a 5 and they have a 2, you win. High card wins. Simple. Check any of our favoured online casinos listed in our casino table above for a large selection of instant-play card games, table games, slot games and more. Raging Bull Casino is our top-rated casino site for players from United States, which has some excellent welcome bonuses available for new players, and offers the option of free play in practice mode or real money bets.